Come to the 39th annual Clinton County Corn Festival! Help celebrate agricultural heritage as they honor one of the area's biggest industries with a three-day extravaganza. The festival features antique farm machinery, a parade, games, all types of food made from corn, a quilt show, musical entertainment, antiques and crafts and the Corn Olympics! 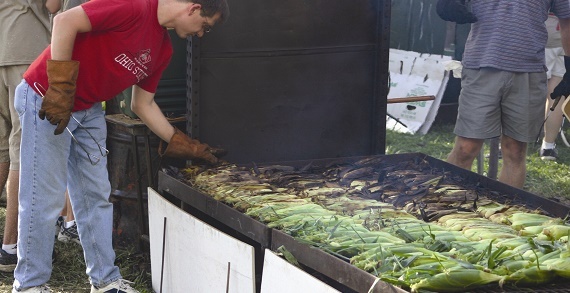 The annual Clinton County Corn Festival will once again bring alive the sights, sounds, smells, and tastes of a bygone era this September. A festival for the entire family, the emphasis of this event is the deep-rooted agricultural roots of the community, and the fun all begins with the blowing of the steam whistle, reminding all within its sound that it’s that special time of year again. The festival will take place September 9-11, 2016. On Saturday, witness the mile-long parade of antique tractors through downtown Wilmington as the Corn Festival Parade gives you a glimpse of the rural flavor of small-town U.S.A. Complete with floats, bands, and community members, “King Corn”, the number one cash crop in Clinton County, is paid special tribute during this hometown parade. At the festival you can feel the rumble of a 70+-year-old, 200 horsepower diesel engine, or get a close-up look at other antique power equipment such as windmills, stone crushers, wheat thrashers, and corn shellers, and the list goes on and on. Come for the country cooking, or to browse the displays of antiques, crafts, and demonstrations of life on the farm as it used to be. There’s no lack of musical entertainment either, as the full schedule includes country, gospel, and bluegrass. The festival also features a quilt show, an antique car show, and an antique tractor show. You can even experience a horse-pulling contest, as teams from across the state are invited to participate. There is even a Corn Olympics, a hilarious competition set to a special theme. Watch as local corporations and service organizations compete in the "Hog Calling Contest," the "Outhouse Race," the outrageous "Obstacle Course," and more. Rural America is alive and well in Clinton County. 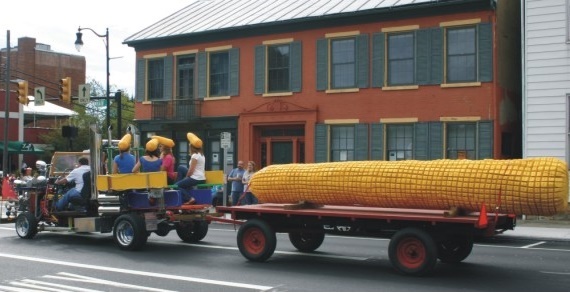 If you have any doubts, be sure and make plans to experience the Corn Festival in Wilmington, Ohio. Get there early to take advantage of the good deals on merchandise and to experience how life used to be on the farm! Weekend passes available at a reduced cost! Clinton County Convention & Visitors Bureau is the destination authority for Wilmington and Clinton County in Southwest Ohio; free literature and assistance for planning your next Ohio getaway. Enjoy fun festivals especially for families such as the Banana Split Festival, the Lavender Festival, the Corn Festival and Hometown Holidazzle. Get back to nature while experiencing state parks and farm experiences, from an Australian Encounter and fossil finding to learning about alpacas. Take a chuck wagon ride on a 350-acre farm that's loaded with activities for families to do such as Clodhopper Golf, an underground tunnel/slide, fishing and more. All located only 1 hour south of Columbus, right off of I-71. Call today for a free visitors guide - 877-428-4748 or visit www.clintoncountyohio.com for many more details.